Laleah Henderson is responsible for the ongoing business operations within the company. As Chief Operations Officer, she manages and oversees the day-to-day operations, including operations strategy and policies and human resource management. Laleah also serves clients through support of special initiatives and lending expertise to the senior consulting staff. Laleah has been involved in the advertising and design community for more than 20 years. Prior to joining EVP, Laleah held senior management roles including Managing Partner at EAI, a design firm (currently Unboundary) and the Director of Creative Services at BBDO/Atlanta, and served on BBDO/Atlanta’s Board of Directors. Simon Moss joined EVP in 2016 and leads our technology initiatives across the firm. He is an IT strategy and innovation executive who brings more than 15 years of consulting leadership experience for clients in the USA and Europe. Prior to joining EVP Simon was a practice lead for North Highland and held senior positions with PA Consulting and Deloitte in New York and London. Jeff Beaudet is responsible for overseeing the financial operations of the company. Jeff monitors economic performance to analyze trends and generate real-time financial reports that aid in management decision-making. Additionally, he is responsible for managing EVP’s employee benefit plans and ensuring compliance in the areas of corporate insurance and State and Federal tax regulation. Prior to joining EVP, Jeff served as a certified public accountant at Crippen & Co. in Ocala, Florida. In this role, Jeff gained valuable expertise in the areas of strategic business planning, corporate taxation and audit compliance standards. Matthew Van Praag, as Chief Executive Officer, is charged with the successful functioning of all Corporate Administration and Operations for EVP. Matthew is responsible for EVP’s success across a broad and diverse spectrum of clients and advertising mediums, leading the path to unsurpassed consulting products for EVP clients. Prior to becoming CEO, Matthew held various leadership and operational positions for the company. Under his leadership, EVP has enjoyed extraordinary growth and remains committed to furthering the standards of excellence and innovation in production counseling established by the founding members of EVP. Throughout her 25-plus year career, Gail Cohen has provided production consultation to advertisers in such diverse industries as Automotive, Fashion & Beauty and Packaged Goods. Gail’s expertise boasts of specialized consultation in live action TV production, editorial post production, computer graphics, talent and residuals, Radio, Print and Out-of-Home services. A highly-skilled negotiator, respected by both clients and agencies alike, Gail has a proven track record in providing production efficiencies without sacrificing creative integrity. Gail currently serves as Trustee of the Village of North Hills in Long Island, NY and is a former Regent of the Film Society of Lincoln Center. She holds a Bachelor of Science degree from Boston University&apos;s College of Communication. Daniel serves EVP as VP of Client Services where his duties include account supervision and broadcast and video review for several key accounts in the automotive, insurance, technology and CPG sectors. In addition to account facing roles, Daniel has served EVP in an operational support capacity. His background helps Daniel maintain an eye on the big picture while providing counsel to clients as they seek to achieve cost efficiencies across multiple facets of production spend. Prior to joining EVP in 2008, Daniel served as a VP of Operations and later as a VP of Corporate Strategy & Marketing for a development company headquartered in Florida. Additionally, Daniel served as a Law Clerk for a legal practice specializing in corporate litigation. In those roles, Daniel gained practical marketing and operational experience that lend a unique perspective to his consulting and management practice. Doris Persicketti offers specialized print, CGI and online production consultation in her role as Senior Consultant. More than this, Doris has played an integral role in forming and growing EVP’s Digital consulting practice. She continues to author and implement EVP’s most sophisticated production initiatives. Prior to joining EVP, Doris served as VP, Director of Production for Foote, Cone & Belding (FCB), formerly Bozell Detroit. Her clients included, among others, the Chrysler Corporation. Previous to this, Doris was a Senior Producer at Young & Rubicam/Wunderman Worldwide, where her clients included Ford Motor Company, DuPont and MCI. She also served as Senior Producer in Point of Sale, Print, Customer Relationship and Event Marketing for VSI Marketing Services where her clients included Ford Motor Company, General Motors, Porsche Cars North America, and Mercedes Benz USA. Cassie Nisbet lends direction and supervision to EVP’s staff of production consultants in addition to coordinating new business initiatives, managing Account Services and leading Special Projects such as Process Audits, Vendor Research and Bid Solicitation. Cassie possesses more than 12 years of experience in production consultation to Fortune 500 advertisers, with a concentration in print production and special projects. Prior to joining EVP, Cassie held influential roles at a national printing firm and at a major television network. She also served as a senior print production manager for several advertising agencies in Los Angeles. Linda directs EVP’s experiential production consulting on behalf of our clients. Her production counsel is grounded by more than 30 years of managing experiential engagements—including press events, dealer shows, trade shows, local and national promotional events. Prior to joining EVP, Linda served as Vice President, Group Production Director for Jack Morton Worldwide in Detroit, MI. Linda’s responsibilities included managing all aspects of Cadillac’s experiential engagements from 2013 - 2015. Prior to her executive leadership role at Jack Morton, Linda held staff positions with Detroit-based Clear!Blue; was an Owner and Exec Producer at Direct Effect; and worked as a Freelance Producer at many Metro Detroit Agencies and Production Companies. In these roles, Linda produced events for clients such as Audi, Ford, Chrysler, Jeep, Dodge and Saturn. Allyson has been a freelance producer for the last 8 years, working with various agencies including McCann, Campbell Ewald, Leo Burnett and Duffey Petrosky. Prior to freelance, Allyson was VP/Integrated Production Manager at Doner managing all the day-to-day broadcast production needs of the agency with over 40 active accounts for television, web and video. Claire has been with EVP since 2002. She has worked with clients including Chrysler, Dodge, Jeep, Toyota, Lexus, Scion, Toyota Parts and Service, Suzuki, Hyundai, Mercedes-Benz, Microsoft, and Intel. She is proficient in all aspects of broadcast consulting and supervises the automotive broadcast consulting group within EVP. She has played an integral role with daily negotiations as well as long term cost savings initiatives and programs. Prior to joining EVP, Claire served in various leadership positions, including Senior VP, Director of Broadcast for D’Arcy (DMB&B) where her clients included Pontiac, Cadillac, GM Parts, Dow Chemical, and FTD. She also held the positions of Executive Producer and Senior Producer for BBDO and Maritz Communication where her client responsibilities included Dodge, Ford, and Lincoln-Mercury. Bonnie McMahon consults on photography and print production estimates for EVP clients. Having an integrated production background in all aspects of photography, CGI, and print helps to make Bonnie uniquely suited to deliver efficient cost consultation while balancing creative considerations. Located in Texas, Bonnie has over 20 years of experience in the Advertising field. Prior to joining EVP in 2005, Bonnie held the position of VP/Director of Art Production at TM Advertising (formerly Temerlin McClain and Bozell). She was a key team player in high profile advertising for Global and National clients such as American Airlines, Bell Helicopter, Subaru of America, JC Penney, Texas Instruments, Nortel Networks, and Nationwide Insurance. Nancy Schroeder draws upon her 25 years of advertising experience to negotiate broadcast, print and interactive production expenditures. Advertisers welcome her counsel especially as it relates to Talent considerations and cost implications. Previous to joining EVP, Nancy served as Vice President, Head of Broadcast Business Affairs/Talent for W.B. Doner in Baltimore, Maryland. Nancy also held the same position at McCann-Erickson in New York prior to her move to Doner. Previous to this, Nancy served as a Senior Business Manager for both Well, Rich, Greene and Young & Rubicam—both in New York. Additionally, Nancy’s experience includes a stint as Production Manager for Stone/Clark—A New York City based Production Company. And finally, Nancy cut her teeth as a bidder for Myers & Griner, Cuesta in New York City. Connie Calhoun brings more than 20 years of experience to EVP’s broadcast clients supervising projects across multiple disciplines. As a Senior Consultant, Connie is responsible for analyzing and negotiating production expenditures, and collaborating with clients and agencies to establish guidelines and best practices to maximize client value. Prior to joining EVP Connie was Director of Integrated Production at Duffey Petrosky working with Ally Bank, Chrysler Fleet, Blue Cross Blue Shield of Michigan, and several hospital accounts including Ascension Health. Prior to Duffey Petrosky, Connie was an Executive Producer, SVP at Doner where her main clients included Chiquita, British Petroleum, and National Car Rental. Genie Bizaoui Fedder counsels on digital media productions for some of the largest advertisers in the U.S. She teams with colleagues and agency partners to review interactive, online and video production. Her specialized work with digital production, advertising and brand sites proves invaluable for EVP&apos;s clients. 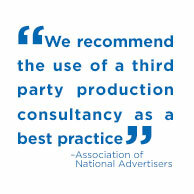 Genie brings to her consulting practice more than 25 years of production experience. In her capacity as Production Manager, Producer, Graphics Specialist, and Sales Manager for Producers Color Service/Technidisc, Grace & Wild Studios (formerly CBS Fox), and Forest Post Production, Genie honed her skills from multiple vantage points within the production space. Additionally, Genie served as General Manager for the Emmy award winning studio Unique Film & Video, Producer for Ross Roy/BBDO, Maritz, and Jackson-Dawson, and as a Digital Media Producer and Sales Consultant to McGill Multimedia, Inc. (now Wireless Ronin). She serviced primarily automotive accounts such as Chrysler, Jeep, Dodge, GM, Cadillac, Buick and Ford. Lisa McLean brings more than 26 years of experience to EVP’s clients supervising projects across multiple disciplines. As a Senior Consultant, Lisa is responsible for analyzing and negotiating production expenditures, and collaborating with clients and agencies to establish guidelines and best practices along the way. Prior to joining EVP, Lisa McLean most recently served as Director of Integrated Production at Wyse Advertising. While at Wyse Lisa was responsible for the quality and execution of advertising content—including broadcast, radio, digital, video and print for a national client base that included Purell, Sherwin-Williams, Marathon Oil, General Electric, Federal Mogul, Applebee’s, Wyndham Worldwide and Office Depot. As a Senior Consultant, Monica is responsible for analyzing and negotiating production expenditures, and collaborating with clients and agencies to establish guidelines and best practices along the way. Prior to joining EVP, Monica most recently served as a Freelance Executive Producer for agencies such as Saatchi & Saatchi, Innocean, Rubin Postaer and JWT. Monica has produced television spots for Hyundai, Buick, Lexus, Honda, Nike, Nationwide Insurance and Gatorade to name a few. Monica has also produced web content for agencies such as Saatchi & Saatchi, The Traffic Agency and Team Garage. Additionally, Monica held the position of Post Production Supervisor for Spot Welders and Arcade Edit. Nicole was most recently at Troika Design Group in Hollywood, where she was the Executive Producer for the Research and Insights department, in addition to producing projects for the A+E Network. Prior to that she worked and ran Arcade Editorial and its sister company Timber Industries, a VFX company, for 4 years. Clients included Toyota, Hyundai, Apple, Samsung and Nike. She continued to work in Production for Timber producing projects for Beats by Dr Dre, and the Grammys amongst others. Nicole&apos;s experience has included running the editorial company Cutters and the sister company Flavor. Clients there included Budweiser, State Farm, Allstate & McDonalds. She was fortunate to work on a short film called “Tsunami and the Cherry Blossom” which was nominated for an Academy Award. She was credited with an Associate Producer title. In addition she was a Senior Agency Producer at Ogilvy in LA and when she started working in commercials. Her first job was with Director Tony Kaye at his production company, Tony K.
Harvey was most recently an Executive Producer at Razorfish in Los Angeles, where he produced broadcast, digital, POP, social media commercials and ‘edutainment’ across 14 U.S. offices. Harvey has produced commercials for Chick-fil-A, Motel 6, Whataburger, Samsung, Blackberry RIM, Phillips 66/Conoco, Oscar Mayer, Kraft, Ritz, Busch Gardens Theme Parks, Nestle Chocolatier, Lean Cuisine, Home Depot, TGI Fridays, Macy’s JP Morgan Chase and Hyatt Hotels. Jacki Angeletti’s expertise is in photography and print production, negotiating photography production estimates and model fee structures. She has vast experience in large productions and talent negotiations and has brought those skills to high-profile EVP clients. Prior to joining EVP, Jacki was a Senior Art Producer for DDB Chicago. Previously, she held positions with J. Walter Thompson, Schafer Condon Carter and Ogilvy & Mather advertising agencies in various roles in print production and media/creative services, including development of a print production department. Jackie provides consulting expertise in the areas of Print, Photography and Image Asset Development, as she plays an integral part in the production processes for EVP&apos;s clients. Prior to joining EVP, Jackie most recently served as Senior Content Production Manager at Ogilvy & Mather and Senior Print Producer at Energy BBDO Chicago. Jackie has managed production of print ads, outdoor, POS, retail displays and has supervised CGI and retouching. Some of Jackie&apos;s former clients included Kimberly Clark, CDW, Frito-Lay, Quaker, Illinois Lottery, Wrigley, Dial Corporation and Jim Beam Brands. As a Senior Consultant, Kara is responsible for analyzing and negotiating production expenditures, and collaborating with clients and agencies to identify and implement production spend best practices. Kara brings over 20 years of broadcast production experience to EVP. The first 8 years of her career were dedicated to Automotive advertising, working on Infiniti at Hill Holliday and Acura at Ketchum Advertising. Kara spent a decade at TBWA\Chiat\Day Los Angeles as an award winning Senior Producer, working on national campaigns for Apple, Energizer, Playstation, ABC Network and Taco Bell. She moved to the MidWest in 2007 as Executive Producer for Cramer-Krasselt, overseeing production for Bissell, Corningware, Johnsonville, Dremel, Pyrex and CCM. After forming KOH Productions, LLC, she Executive Produced Toys R Us’ national holiday campaigns. Kara has shot in New Zealand, South Africa, Canada, Hawaii and all over the United States. Linda Kemp draws from her background as an Executive Producer and Content Director for multiple clients, including experience with several automotive accounts, to provide our clients with outstanding counsel in production of visual effects, animation, design and graphics, as well as all aspects of talent and celebrity negotiations. Prior to joining EVP, Linda held production positions at Campbell-Ewald as SVP Executive Producer/Content Director, Senior Producer for DMB&B, and Production Coordinator for Joseph Productions. In her roles, Linda was responsible for quality and execution of all advertising content including production and integration of broadcast, digital, direct mail, collateral, and print for prominent clients across multiple disciplines. As a Senior Consultant, Tony Cotroneo serves EVP clients within the automotive, pharmaceutical and telecommunication sectors by negotiating broadcast, print and radio production expenditures, coordinating editorial and talent considerations, and introducing best practices for continued production cost controls. Prior to joining EVP in 1998, Tony held various leadership positions during his 15-year career in production and advertising promotions. Tony developed and produced successful promotional campaigns for several Fortune 500 companies. Connie Newberry brings a keen production management and supervision eye to her consulting practice for EVP’s clients. As a senior consultant, Connie is responsible for analyzing and negotiating production expenditures, and collaborating with clients and agencies to establish guidelines and best practices along the way. Prior to joining EVP, Connie most recently served as Senior Vice President of Production for 22squared’s production department—where she was responsible for managing and supervising a staff of audio, video and digital producers, editors, business affairs and external traffic personnel. Additionally, Connie established and managed two in-house editing suites. While at 22squared, some of Connie’s clients included Southeast Toyota Distributors, Florida’s Natural Orange Juice, Baskin Robbins, Publix, Buffalo Wild Wings, BellSouth Corporate, NAPA, SunTrust Banks, Russell Athletic, Simmons and Saks Department Stores. Before her time at 22squared, Connie served as a Senior Producer for BBDO, Atlanta. Kathleen serves as a senior broadcast consultant for a range of clients across multiple industries. EVP&apos;s clients rely upon Kathleen&apos;s global production experience to provide specialized counsel as they seek to produce work in a complex, global environment. Before joining EVP, Kathleen served as the Director of Broadcast Production for ten years at a premier Asian American Ad Agency. There she supervised and managed productions in Australia, Canada, China, India, Malaysia, Philippines, Thailand, and the USA. She produced award-winning campaigns for McDonald’s, MetLife, Farmers Insurance and Anti-Smoking. She also held the position as Senior Producer at Foote Cone & Belding, Mattel and worked on the Production side representing Directors. Jennifer Engelstad directs EVP's auditing efforts as Head of Auditing Services. Her responsibilities include coordinating and supervising the Auditors, and the billing, on behalf of all EVP clients. Jennifer also manages the day-to-day functions of the Atlanta office. In addition to her supervisory role, she services as Lead Auditor for some of EVP's largest automotive, food and retail clients. Prior to joining EVP in 1997, Jennifer held positions within the Broadcast and Business Affairs departments at BBDO Atlanta, as well as Traffic Manager at MasterSound, an Atlanta audio facility. Her hands-on experience with management duties make Jennifer valuable to the EVP family. Sandy Tyler brings more than 20 years of broadcast and video producing experience to EVP’s clients. As a Senior Consultant, Sandy is responsible for reviewing and negotiating production expenditures for broadcast and video productions, establishing best practices and opening up productive communication lines between clients, agencies and vendors. Prior to joining Ernst-Van Praag, Sandy had her own production business in Atlanta, allowing her to work with advertising agencies and directly with clients, planning and supervising TV, radio and video productions of all sizes and controlling costs from both sides of the business. Her major brand experience includes work with The Coca-Cola Company, Verizon Wireless, Hewlett-Packard, Toyota, AutoTrader.com, Moe’s Southwest Grill and Southern Company. Linda brings thirty years of experience with respect to bidding, budgeting and managing commercial and film productions to her work as a Senior Consultant for EVP. With a sophisticated understanding of production issues, Linda is responsible for analyzing and negotiating production expenditures, and collaborating with clients and agencies to establish guidelines and best practices along the way. Previous to her time at EVP, Linda co-owned and managed a vibrant television commercial production company in Hollywood, California. Linda managed all aspects of production and client relations from business development, submission of bid proposals, and successful project completion for six commercial directors. Additionally, Linda has served as a Freelance Executive & Line Producer for film, commercial, corporate videos and feature length documentaries. Donna Nobles interfaces with marketing clients and their partners to review CGI, CRM, event, photography and print estimates. As a valuable member of the EVP team Donna lends her expertise to special benchmarking and project initiatives and conducting requests for proposals. Before joining EVP in 2004, Donna served as a Production Manager for a Detroit Advertising Agency, Weaver Ladd Harries McGowan. As an Integrated Art, Event, Media and Print Buyer, Donna’s duties included managing staff, developing budgets, coordinating schedules, attending events, press approvals and photo shoots. Subsequently, she served as an Account Manager for Clark Graphics, a prominent Detroit printing company, where she managed accounts, budgets, marketing, contracts, billing, scheduling, and press approvals for major Detroit corporations and advertising agencies. Donna has held several leadership positions in the Advertising Production Club of Detroit where she currently serves as Treasurer. Prior to joining EVP, Mary Margaret held the positions of Executive Producer and Business Manager at McDonald & Little, Ted Bates/NY, Darcy, Fahlgren & Swink, and Bozell. During this time, Mary Margaret cut her teeth in the field, which informs her consulting work at EVP. Paula Voorhies is responsible for client contract and stewardship administration. Paula has structured EVP&apos;s reporting mechanisms to allow efficient analysis of the production expenditure’s impact on advertising budgets, and to quickly identify key variables and trends. Clients are continuously updated on initiatives secured on their behalf and the financial savings achieved on production dollars. As an Art Buyer and Accounting Manager for BBDO, Fitzgerald +CO, and Elemental Interactive Design, Paula’s previous advertising production and financial management experience combines to shape and inform her financial reporting perspective in unique and valuable ways. Vida Albert has counseled many Fortune 500 advertisers on broadcast, video and digital production over her 20-plus years of experience, many of whom have been EVP clients since the company&apos;s inception in 1970. Vida Albert has extensive knowledge in all aspects of broadcast, live action, radio and print production. She also specializes in talent & residual estimating, agency travel analysis and other broadcast and print-related productions, providing increased cost efficiencies. Andy Greer is a Talent Consultant with more than 25 years of industry experience. She interfaces with EVP clients and their Agencies to review Talent and Residuals estimates and invoices, to assure accuracy and compliance. Andy keeps up to speed on SAG/AFTRA, ACTRA and AFM commercial contracts so that she can advise Clients on the myriad of union related issues. Prior to joining EVP, Andy served as Talent Business Manager for J. Walter Thompson (JWT) Atlanta for 19 years. Her responsibilities included reviewing storyboards and scripts to determine on-camera and extra status and session costs, budgeting residual costs and managing union disputes, penalties and audits. Prior to her time at JWT, Andy managed talent and traffic at BBDO Atlanta for 8 years. Teri Beltran brings value to EVP&apos;s clients with her mix of digital production experience and business diplomacy skills. As a Digital Producer for Deutsch, Los Angeles, Teri has directed in-house digital creative and development, as well as third-party production vendors across multiple digital platforms. Teri has also served as the General Manager and Lead Project Manager for DigitalProduce where she was responsible for personnel management, client communications and digital production. Throughout her career, Teri has overseen projects ranging from 3D animation and online games to the development of proprietary technology applications. Kathryn Hooper has seven years of experience successfully producing marketing, communications, and advertising strategies for clients worldwide; leveraging broadcast, digital, and mobile mediums. Prior to joining EVP, Kathryn served as a Senior Digital Producer for TBWA/Media Arts Lab, Los Angeles. Previously, she has worked as a Producer at Ogilvy & Mather and Mendelsohn Zien in Los Angeles. Kathryn also has prior experience as an Account Manager at Epsilon Network in Richmond, VA. Kathryn’s body of work includes websites, microsites, web video, online advertising, rich media, mobile and tablet apps, digital, print, and emails. Jennifer is a Video and Event Producer, Senior Producer and Director. Jennifer’s work has resulted in a wide-ranging and international client portfolio, which includes Fortune 500 corporations, NGOs, Nonprofits, and government agencies. She has worked with such luminaries as President Bill Clinton, Paul Kagame, Bishop Desmond Tutu, Ringo Starr and many more. Jennifer originates from Detroit, where she got her start creating events, videos and music. Ann Smits chiefly manages and consults a range of EVP&apos;s airline, auto and retail clients. Her consultation covers the intricacies of broadcast production financial management, as she routinely calls upon her diverse expertise and unique skill set to bring production value to clients. Prior to joining EVP, Ann held executive positions in marketing at various national advertisers as well as at prominent advertising agencies. As Managing Director, Worldwide Advertising and Promotion for American Airlines, she spearheaded the communication efforts of multiple worldwide advertising agencies. She also served as Marketing Vice President for United Way of America, providing strategic communications leadership to the organization. On the agency side, Ann served as Management Supervisor for Temerlin McClain Advertising agency and Management Supervisor for Bozell. Lindsay was most recently at Grey Advertising in New York as a producer working on DIRECTV, Advil, Robitussin, Pradaxa, Breath Right, Allianz, Dairy Queen, Nice & Easy and Natural Instincts. Prior to Grey, Lindsay was a Production Coordinator on the BBC Worldwide show, “What Not To Wear”. She also worked with City Lights Television. Carrie was most recently with David & Goliath as a Senior Producer working on Kia, Universal Studios Hollywood, Universal Orlando Resort, The Art Institutes, California Lottery, NYNY Hotel & Casino, Monte Carlo Hotel & Casino, Mammoth Mountain, Beats by Dre and Infinitum Spirits (Seagram’s Vodka and Fernet-Branca). Prior to David & Goliath, Carrie was a Producer at Bernstein-Rein Advertising in Kansas City, Missouri where her main clients included Time Warner Cable, McDonalds, Wal-Mart, Bayer Animal Health (K9 Advantix), Beauty Brands, The Kansas City Zoo, The United Way, Blockbuster Video and Farmland Foods. Loy Conley directs the EVP Digital Team in their efforts to review, evaluate and benchmark production hours and associated rates and costs for digital projects which include Rich Media, Banner Campaigns, Social Media, Microsites, Mobile and Tablet Apps, and Influencer implementation for national and international advertisers. Loy enjoys over ten years of experience in senior and executive level positions within digital advertising production. Most recently as the Director of Digital Production for Deutsch, she directed a cross-functional team in the production of large banner campaigns, Rich Media, Online Games, Apps and video-integrated development for celebrated brands. EVP clients benefit from Loy’s creative thinking, business savvy and sound leadership. Angela Cooper reviews production estimates against previously negotiated rates for digital, broadcast, and print mediums as well as miscellaneous and support projects to assure costs are in alignment. Angela also audits billing for production jobs to ensure that costs remain within the negotiated bid amount and EVP/client approved expenditures. Additionally, she works with EVP’s DataLink™ system and is responsible for maintaining the integrity of client fiscal reporting. Prior to joining EVP, Angela spent 15 years in the advertising industry with extensive experience in billing and accounts payable. She most recently was an office manager with a manufacturing representative firm where she orchestrated accounting operations. Dawn Petway is responsible for the duties of the Data Analyst and Audit Administrator for many of EVP’s clients. In addition, she provides support in countless ways to all of EVP’s Consultants and performs auditing services to provide our clients with accurate and complete financial data. Dawn has been in the advertising business for more than 15 years. Prior to joining EVP, she worked with MEC of Atlanta, where her clients included AT&T, IKEA and Isle of Capri. At MEC, Dawn handled vendor contracts, invoice inquiries/discrepancies and reconciled client billing. Sandy Gopal is a Senior Auditor for EVP charged with supervising various levels of billing for EVP&apos;s automotive, consumer goods and technology clients. As a liaison between agencies and clients, Sandy works to resolve billing issues and ensure compliance with billing procedures. Sandy has more than 15 years of experience in broadcast and print production auditing. Prior to joining EVP, Sandy served as a supervisor of the retail bond section at Nesbitt Thompson, a brokerage firm located in Toronto, Canada, maintaining and balancing client accounts. Previous to this, Sandy served as a specialist at the Toronto branch of National Trust where she was responsible for entry of lending and borrowing stocks to fill client trades and maintaining client reports. Melanie Pouncey interacts with consultants, clients, and agencies to service our clients in multiple capacities. She is responsible for inputting fiscal data into EVP’s database system, DataLink™, and ensuring that information regarding estimated costs and associated savings is accurate and complete, and that appropriate funds are allotted for projects. In addition, Melanie is responsible for maintaining the integrity of client fiscal reporting and assessing production billing to provide a correct statement to the client based on contract guidelines. Melanie is also responsible for updating client procedures and aiding in the creation of procedures for new clients. Melanie’s prior experience includes management in a large retail space at O’Hare Airport in Chicago, Illinois, where all aspects of business were realized. Additionally, Melanie has extensive billing and accounting experience gained from working with a local Atlanta, Georgia advertising agency. Heather brings a set of well-honed skills to her role as a Data Analyst and Auditor on behalf of EVP’s largest clients. Heather reviews production billings against previously negotiated and EVP approved estimates to ensure costs are in alignment. Rachel Yarbrough reviews production estimates against previously negotiated rates for digital, broadcast, and print mediums as well as miscellaneous and support projects to assure costs are in alignment. Rachel also audits billing for production jobs to ensure that costs remain within the negotiated bid amount and EVP/client approved expenditures. Additionally, she works with EVP’s DataLink™ system and is responsible for maintaining the integrity of client fiscal reporting. Prior to joining EVP, Rachel sharpened her "attention to detail" skills in important roles in the insurance industry, as a Claim Analyst for a Life Insurance Company, and as an Insurance Specialist for a Health Insurance Company. She also has years of business experience in Client Service, Office Management, and Business Management for organizations in the healthcare and financial sectors. Our full-time staff of 48 consultants and auditors have previous hands-on experience in their prospective fields: broadcast, video, digital, print and experiential, as well as continue to maintain memberships with advertising associations such as SAG/AFTRA, ATAS, ANA, DGA, AICP, PGA and more. Together, the EVP team delivers an unrivaled depth of experience and innovative approaches to its collaborative consulting practice. We invite you to get to know our company. Select a category on the left to learn more about our team.